To gather in Circle is a sacred event when all minds are focused as one. King Arthur’s Knights of the Round Table come to mind as well as more modern Circles that are changing the world where the power of Women gather to lend their support for World Peace, World Hunger and other challenges the world faces in today’s ever changing and evolving societies. (see The Millionth Circle and Gather the Women, Save the World by Jean Shinoda Bolen, MD.) Dr. Bolen spoke how the women are joined by some very supportive and powerful men who bring their energies to support the work of the women in Circle. There are numerous reasons why coming together in Circle is so very powerful. A circle has no beginning and no end and is often referred to as a symbol of unity and perfection and even protection. In nature we see the Circle repeated time and time again in wonderful examples of nature’s awesome gifts. How often do we think of a Full Moon shining in the heavens as a Circle in all its perfection? Indeed! We experience each month not only a perfect Full Moon, we also experience a beautiful New Moon that brings the waters of the oceans and tides to its fullness. It is another perfect circle and one that supports farmers, gardeners, and plant life as this is the best time to plant our kitchen gardens and watch our seeds produce an abundant harvest. It is during the time of the New Moon I love to offer Circle so all who wish to “plant their mental seeds” for their future can feel protected and supported knowing their “mental seeds” will take root and grow and manifest into their lives, energized by the Circle. In Circle to express Gratitude for everything already received is very powerful. The Circle is respected as an archetype of wholeness and integration, with the center understood to symbolize Spirit – The Source. This is the beauty of Circle and today more than ever the women of the world are being called to gather in Circle to support each other and to share their wisdom with each member of Circle. Circle is also referred to as the Eternal Ring. No doubt the wedding band exchanged in the wedding ceremony when two people pledge to support and love each other got its name from the Circle, the Eternal Ring now referred to as an Eternity Ring. I welcome anyone who has another take on the wedding ring or Circle to share it. As I sit and write this my mind floated back in time to my Reiki Level One Class over 20 or more years ago. My Reiki Master always had the room set up so the students and herself sat in Circle. It was my first experience of a teacher sitting side by side with students in Circle and I now honour Circle in all of my classes, especially meditation and Reiki. I was in awe of her wisdom and humbleness. Even more so when I realized how fortunate I was to be taught by one of the most experienced cancer care nurses in the United States who had the distinction of having been chosen Holistic Nurse of the year on several occasions. “No one above, no one below,” was surely her motto. So why is a Circle so special, so sacred and so powerful! Here is one example: When we gather and sit in Circle, we recreate this perfection of sacredness. We get to experience the energy and wisdom of each person sitting in Circle, knowing no one is above, neither is a person below another. Everyone in the Circle is on the same level. Each person is considered an equal. 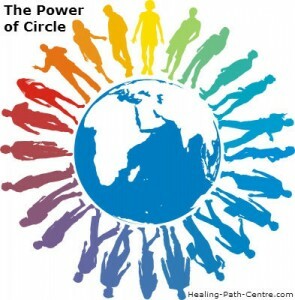 I am told that many cultures use the circle for healing a wrong and the entire village comes out and sits in circle with the wrong doer sitting inside the circle, and they sit in circle until they reach resolution, which is always for the highest good of all concerned. That is the Power of Circle! Do share your Circle. Until next time!